PHOWN is global. Weavers are found naturally in Africa, southern Asia and some Indian Ocean islands. They have been introduced to other continents and any wild breeding colonies may be included in the project. Captive colonies (zoos and aviaries) should not be included. Please make sure that the datum of your GPS is set to WGS84. Ensure that the coordinate values are given correctly. Always record the southern coordinates (latitude) first and the eastern coordinates (longitude) second. Use seconds, not hundredths of a minute. Set your GPS readout accordingly. 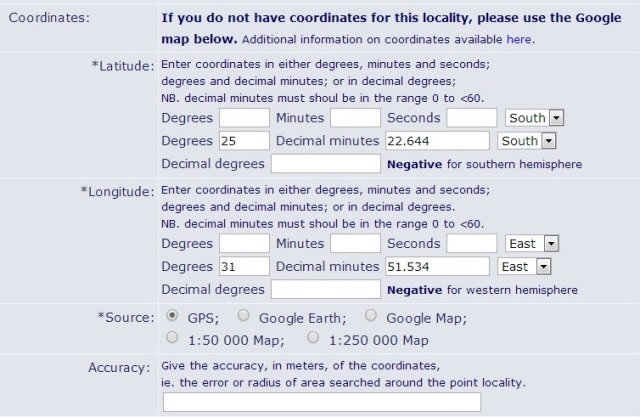 then this format is degrees with decimal minutes so you would fill in the second line for Latitude and second line for Longitude when uploading a record, as shown in the figure below. iii. a 1:50 000 government map. For colonies along roads or on farms or remote areas, note that it may be difficult to pinpoint the exact spot on google maps. In such a case a gps needs to be used. It is critically important that the locality be recorded accurately because the record is useless without its location, and positively misleading if the location is incorrectly recorded. If you have submitted incorrect coordinates, see Corrections.